It is a weight loss surgical procedure to lose between a 50-60% of excess weight, in which the stomach is reduced to approximately 25% of its original size, along the greater curve. The procedure permanently reduces the size of the stomach, it is performed laparoscopically, and it is irreversible. The Gastric Sleeve can also be carried out as a previous step to a Gastric Bypass in patients with a BMI above 60. Calculate your BMI (Body Mass Index). - Personal information is taken from the patient to enter the operating room area. - An intravenous line and antithrombotic compression socks are placed on the patient. - The Anesthesiologist interviews the patient to go into the operating room. - The patient is put under anesthesia to clean and prepare its skin, and dressed in sterile clothing. - Five small incisions are made in the abdominal wall, or one incision in the case of a single port. - CO2 is introduced into the abdominal cavity to create an optimal working space. - Introduction of work ports, an inspection of the abdominal cavity is made. - Calibration of the sleeve with a 32-36fr probe. - Lengthwise resection of the stomach through a stapling endoscopic system. - Trans operative tests are performed with dye to verify the tightness of the sleeve. - Extraction of surgical piece. - Invagination of the staple line with a nonabsorbable suture to minimize the risk of bleeding and leakage. - The capacity of the stomach after the procedure is approximately of 150ml. - Work ports and CO2 are extracted, and abdominal wounds are closed both internally and externally. 1.- The patient goes to the recovery room and later to its personal room. 2.- The patient can start walking the same day. 3.- The next morning a test is done through water-soluble contrast and fluoroscopy to verify that there are no leaks and to see the anatomy of the sleeve. 4.- The patient will start taking in clear liquids and if they are tolerated, the patient could be discharged. Medications taken during the first two weeks should be crushed and dissolved. - The first revision is after three days the patient is discharged. Afterwards, the patient must go for a check-up the following 3, 6 and 9 months. - Stitches are removed 10 days after the surgery. - The patient will have nutritional and psychological monitoring during the process of weight loss. - One month after the surgery, the patient will be able to perform any type of physical activity. Endorsed by the International Federation for the Surgery of Obesity and Metabolic Disorders and the American Society of Metabolic and Bariatric Surgery. Recent studies have found that it is safe and effective, which results in weight loss similar to the weight loss observed in adult patients who undergo the procedure without affecting their growth or development. 1.- Control over chronic-degenerative diseases such as Diabetes, due to the hypocaloric diet and the weight loss, plasma glucose levels are lowered, and sensitivity to insulin is improved. 2.- Energy consumption is significantly reduced by inducing a negative energy balance, a condition that improves glucose tolerance and causes weight loss that also leads to hormonal changes in ghrelin, leptin, GLP 1 and PYY levels. - Starting the diet: less than 24 hours after surgery. - Integration to your daily tasks: two weeks after surgery. - Sports performance: one month after surgery. • Medicines inside the hospital. • Nutrition consultation after surgery (1 and 2 of nutrition and / or one month of follow-up). • Psychological assessment + 1 consultation (stage 1 and 2 of Psychology) / or one month of follow-up. • Stay of a companion in the facilities of the hospital. • Extra charges due to complications or extra non-standard tests additional to the package offered. • An additional charge applies to patients with a BMI (Body Mass Index) greater than 50, which is considered high risk. Once your appointment for surgery is confirmed, the hospital will require an initial refundable deposit to reserve the date suggested by you and the balance will be reimbursed. * A previous deposit is required to confirm the surgery. WHICH SURGEON WILL PERFORM THIS PROCEDURE? 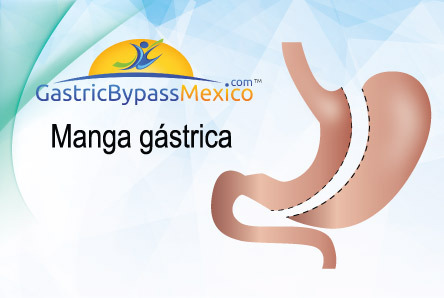 Gastric Bypass Mexico has a specialized medical team led by Dr. José Castañeda Cruz, a leading Bariatric Surgeon in Mexico, with more than 9,000 procedures successfully performed on his account. All our Specialists are certified and have been trained both in Mexico and abroad. IS IT SAFE TO FLY AFTER HAVING THIS SURGERY? Immediately after the surgery, there is a greater risk of developing blood clots. Patients will be provided with special socks and medications, and exercise will be recommended to minimize the risk. Therefore, patients are not recommended to take long distance flights. IS THIS A REVERSIBLE SURGERY? This surgery involves the permanent removal of a large part of the stomach and, therefore, the procedure is not reversible. WHAT DOES THE TERM LAPAROSCOPIC GASTRIC SLEEVE MEAN? While conventional surgery is carried out through a long incision, laparoscopic surgery (also known as “Keyhole”) requires a series of small incisions (5-15mm) through the abdomen. The Surgeon inserts a thin camera and instruments through them, being able to complete the surgery externally. SINCE WHEN HAS THIS PROCEDURE BEEN DONE? Gastric Sleeve surgery has been an independent procedure in the past two years ago. Before this, it was implemented as an initial procedure composed of two phases for patients who had significant obesity and could not be subjected to other types of surgeries. It was discovered that the Gastric Sleeve surgery offers significant weight loss benefits, as well as for health, eliminating the need for additional surgeries. WILL I BE ABLE TO DRINK ALCOHOL AFTER THE SURGERY? It is not advisable to consume alcohol during the first six to eight weeks after the surgery. Keep in mind that a Gastric Sleeve surgery causes alcohol to be absorbed faster and patients often feel intoxicated quicker, even with smaller amounts. Alcohol is extremely rich in calories and can slow down a patient's weight loss process. We recommend that patients be especially careful with carbonated alcoholic beverages that can cause bloating and pain in the stomach pouch. WILL THE SCARING BE BIG? In general, there is a minimal scaring. In Laparoscopic surgery, a long incision is not performed. Instead, the Surgeon makes five small incisions through the upper abdomen and these are closed, either with surgical glue or soluble staples. Scars are usually healed in two or three weeks, and their appearance fade away with time, and must be covered for a week after the surgery. Patients must follow a liquid diet for two weeks to protect the stomach and maximize the recovery. Your Doctor will work with you to establish a specific diet guideline, taking in account the different physical and health conditions of each patient. WHAT HAPPENS IF I STILL FEEL VERY HUNGRY AFTER THE SURGERY? Often there is a physical and psychological component in cravings, and it is important to learn how to distinguish each one. Gastric Sleeve surgery removes the section of the stomach responsible for the secretion of hormones that induce cravings, so patients often experience a significant reduction in appetite. Patients are coached in healthy practices before their surgery. WHAT IS THE MORTALITY RATE IN THIS PROCEDURE? The mortality rate for patients undergoing a Gastric Sleeve surgery is of 0.08%. This is less than in a hip replacement surgery or gallbladder surgery. CAN MY CURRENT MEDICAL PROBLEMS AFFECT MY WEIGHT LOSS SURGERY? Gastric Sleeve surgery is ideal for patients whose current weight or medical problems prevent them from undergoing other procedures that would be dangerous. Pre-existing conditions such as Type 2 Diabetes, sleep apnea and high blood pressure improve with weight loss, therefore, this surgery can be beneficial for them. It is crucial to inform and discuss all these existing medical conditions with your Doctor before surgery, to ensure that all necessary tests are done, and the risks are minimized. OW WILL MY DIET CHANGE AFTER THE SURGERY? Patients are encouraged to follow a mixed and healthy diet to maximize weight loss and establish a pattern of healthy eating habits. Going back to low quality dietary habits can cause a reduction in the rate of weight loss. Patients will be allowed to include a wide range of foods in their diet, which will be designed by one of our Doctors during each recovery phase. WHEN WILL I BE ABLE TO DRIVE AFTER THE SURGERY? Patients can drive 4 to 5 days after the surgery. However, some countries establish a minimum period during which patients should refrain from driving after a surgery. Therefore, it is recommended that you check the specific requirements of each country. SHOULD I EXCERCISE AFTER THE SURGERY? The risk of developing blood clots after a surgery is higher and physical activity can help reduce it, which is why exercising is recommended after the surgery. It can also increase calorie burning throughout the day and strengthening of the body and the joints. Patients often realize that their physical activity tolerance increases as they lose weight, which is why it is recommended to create an exercise routine between three or four 30-minute sessions each week. WILL I HAVE TO TAKE MEDICATION AFTER THE SURGERY? Patients with a Gastric Sleeve are usually recommended to take a high-quality multivitamin, folic acid, iron and vitamin B12. Immediately after the surgery it is likely that you will be given tablet o liquid analgesics with a proton pump inhibitor to protect the stomach and control acid secretions. This information will be given to you by your Doctor before the surgery. HOW LONG WILL I HAVE TO STOP WORKING? The period of work leave depends on the type of work. Some patients may experience a sensation of having less energy and weakness after a Gastric Sleeve surgery, while others recover relatively quickly. Patients are usually advised to take two or three weeks off work, however for patients with physically demanding jobs this period may be longer. HOW LONG WILL I HAVE TO STAY IN THE HOSPITAL AFTER THE SURGERY? The procedure usually takes about 60 and 90 minutes. However, patients will spend the night at the hospital and return home the next day after performing medical tests and checking that the operation has been successfully completed. In case you must stay longer, you will be informed in advance by your doctor, Dr. Castañeda. WILL I LOSE ALL THE WEIGHT QUICKLY? Weight loss is usually faster right after the surgery, since the diet is limited. On average, patients will lose around 10 pounds each month, and it is recommended to them to follow a healthy and nutritionally complete diet, along with exercise to maximize weight loss. HOW MUCH WEIGHT WILL I LOSE WITH A GASTRIC SLEEVE SURGERY? Generally, patients can expect to lose 10 pounds per month, achieving a loss of 20% to 80% of excess weight during the first 2 years, this depends on their initial weight at the time of the procedure, the time invested in exercising and if how they follow their diet. Send us an email and a coordinator will contact you.